Now, I was looking for a bit of color, but I really didn't have time for any fussy flowers. The veggie garden was more than enough for me to try and take care of with 3 small children and being in the hayfield all summer. For the next several years, although we enjoyed our MARY TODD immensely, our lives were still busy with the children and all the responsibilities that go with running a small dairy farm. MARY TODD remained our only daylily. Our garden grew and then slowly began to transform as the children became more independent, and then left home for college. We found that once we no longer had the dairy cattle to care for, we had some time for the first time to have a hobby. The garden seemed to naturally evolve into that hobby. Harold was the driving force, and has the artistic vision. I am the "almost always willing" weeder, helper, and bookkeeper. We began to acquire new plants to add to the gardens, a mix match of plants that more and more frequently turned out to be daylilies. It was almost as if daylilies were picking us, rather than our knowingly selecting them. It was about 1995 that Harold came across a roadside stand where an elderly lady was selling irises and daylilies. I think he probably stopped to see what she had for irises, as that is what he had been purchasing most recently. But, when he left her garden he had a couple of pots of daylilies under his arms. Mrs. Kinsley became a regular stop for us whenever we were in her part of the state. From that point on we never went anywhere without looking for garden centers and plant sales which we could visit along the way. 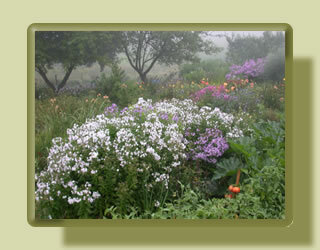 It was while looking for a garden center that we had heard of that we happened upon a spectacular garden of daylilies. Harold had stopped for directions, and the gentleman who was talking to him told him that if he liked gardens, he should skip that garden center we were looking for and go visit the garden of his Mother-in-law. Well he called to see if she minded company, then gave us directions to her house. That lady turned out to be Claire Shepard. She shared her love of daylilies with us, and gave us a grand tour around her amazing garden. She knew every plant on sight, without looking at the nametags! She knew the hybridizer, the date registered, and the parentage on sight! (We didn't really know at that time what all that information was, but it was pretty impressive that she could just spout it off.) We were totally "bitten" by the daylily bug before we were half way through the tour. 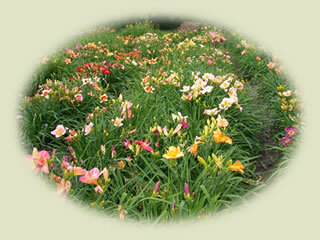 Imagine an entire garden of daylilies all arranged by the decades of their registration. All were award winners. She had told us about a group that we could join that would put us in touch with other gardeners who loved daylilies. She gave us our very first look at a daylily journal, and gave us the application sheet so that we could become members too. I wonder if I knew then what I know now if I would have been so complacent about our new path. We currently grow more than 2200 registered varieties of daylilies. We have "bagels" (round and ruffled), "spiders" (tall and skinny), doubles, and more. Most of the well-known hybridizers are represented in our collection. We have everything from the "oldies but goodies" that nobody should be without, to many of the latest and greatest of the new "designer" daylilies. A rainbow of color blankets our back yard and old pastures from June to September when the daylilies are in bloom. For the past few years we have been open on a very limited basis for the public to come and walk the gardens on our "open garden" days. We are an official AHS Display Garden for Region 4, so if you are in our area we hope you can make an open garden date, or will call or drop us an email so we can arrange a time for you to visit. Joining the AHS (American Hemerocallis Society) was really the beginning of a fun journey. We found there were others like us, and they also had yards full of beautiful daylilies. We have made many new friends throughout the US and even from other countries. We attend the New England Daylily Society regularly, and use most of our vacation time to attend regional and national conventions, where we have seen many amazing gardens. We have had a wonderful time talking daylilies, eating daylilies, and even drinking daylilies (another story for another time). Harold and I would like to encourage all that enjoy daylilies to join the AHS and to attend a local daylily meeting. Check out the AHS web site at www.daylilies.org - there is loads of information there about our favorite plant and the folks who love it. If you are anywhere near Boston, I invite you to come and check NEDS out. We love new members.